Strange Rumblings in Shangri La is directed by Joe G and features Globe surf team riders Dion Agius, Nate Tyler, Taj Burrow, Damien Hobgood, Creed McTaggart, CJ Hobgood, Noa Deane, and Brendon Gibbons. Strange Rumblings in Shangri La is a modern surf film that documents an unforgettable worldwide journey from the frigid shores of Iceland to the sultry coastline of Mozambique. From well-known spots in Europe to exotic islands off the coast of Brazil and into the deepest Indonesia, this is their greatest adventure yet. Shot entirely in Kodak super 16mm and with an original soundtrack created and curated by International DJ duo The Dukes of Chutney, Strange Rumblings in Shangri La will be an audiovisual psychedelic surfing video DVD experience like nothing ever created before. Expensive P. Movie - When surrealism hits the surfing scene, the best thing you've got to do is watch an "Expencive P. Movie." Surf movies are getting very experimental. Forget classic Hollywood angles, high-tech video effects, contemporary editing and mainstream soundtracks. Today, everything's a lab. "Expencive P. Movie" was shot entirely on Super 16mm, and that is why you'll notice that grainy look in every surf move, for Tin Ojeda, the director behind this 1970s-esque surf flick, got the inspiration from Quentin Tarantino's approaches. The final result focus on West Coast surfing, with an indie East Coast look. "Expencive P. Movie" features Dane Peterson, Kassia Meador, Alex Knost, JJ Wessels, Mikey DeTemple, Trevor Gordon, Kyle Albers, Devon Howard, Justin Adams, Scotty Stopnik, Jared Mell, and Ryan Burch. A one year surfing DVD movie project as seen through the eyes of Southern California Filmmakers Riley Mundia and Bryan Johnson. This surf film will take you on an awkward roller coaster of skits and oddities; alongside passion laden surfing by elite riders. Featuring Nate Yeomans, Cory Lopez, Torrey Meister, Austin Ware, Ricky Whitlock, Jeff lukasik, JD Lewis, David Suhadolnik, Hunter Lysaught, and wonder grom Ryland Rubens. Mecca II travels through So Cal, Hawaii, Costa Rica, Mexico, and British Columbia. Mecca II Presented by Hoven, and produced by BEE-STING Productions. Incredible surfing video. Jason Baffa chronicles Del Moro on an amazing journey back to his ancestral homeland with elite standout professional surfers Dave Rastovich, Lauren Lyndsey Hill, Conner & Parker Coffin and Italy's top surfers Alessandro Ponzanelli and Leonardo Fioravanti as they explore the burgeoning surf culture blossoming in the Mediterraneans oldest and cherished traditions. A visual epic captured in 35mm, Bella Vita presents an intimate, powerful journey of self-discovery where the unique powers of family tradition intersect with the enlightenment of re-discovery in a forgotten natural resource. If youve seen One California Day, you know that Baffa has a cinematographers eye, and a talent for cruisy, contemplative rhythm and thats mostly the feel of Bella Vita as well. The Groove Move surfing DVD title celebrates experimental board riders. Slow Dance surfing DVD - Surfer and Director Dane Reynolds takes a sharp look into the timeless style of Craig Anderson. A modern approach with hints to the past, Slow Dance follows Craig in and out of the water as he travels the world meeting up with heroes and friends in Australia, Chile, India, West Africa and Tahiti to name a few. Dane attempts to uncover Craig's view on style, but only vague answers emerge. However, it becomes apparent that whether Craig is riding a thruster, single fin or doing whatever style is a part of everything he does. Featuring Craig Anderson, Dane Reynolds, Matt Hoy, Rob Machado, Chippa Wilson, Dion Agius, Mark Occhilupo and Ozzie Wright. The Groundswell surfing DVD video is Chris Malloy's follow up to 180 South. Surfers Dan Malloy, Trevor Gordon and Pete Devries set sail on a 68 foot sailboat guided by the Raincoast Conservation Foundation into British Columbia's Great Bear Rainforest where a pipeline and oil tanker proposal looms. The team explores waves and a rainforest full of life while learning of the potential irreversible consequences of this project from local First Nations leaders. Groundswell beautifully and profoundly captures the spirit of this wild place and the passion of the Heiltsuk people who are committed to protecting it. The Bending Colours surfing DVD + Blu Ray is a moving portrait of Jordy Smith. This is not a biopic. Its a never-before seen insight into gamechanging next level surfing. From an average school kid in South Africa, a cocky tour rookie,to the professional world title threat he is today, Bending Colours tells a story. No one does progressive surfing or the hi-fi quite like Kai Neville. The fit is obvious. You know Modern Collective. You know the new breed of surfer, soundtrack and star its created. This next collaboration will further redefine and change the game.. Featuring Jordy Smith, Dane Reynolds, Mitch Coleborn, Kolohe Andino & Dusty Payne. Sipping Jetstreams Media presents This Time Tomorrow, a surfing DVD film by Taylor Steele, documenting an epic Pacific swell chase over 8 days and 18,000 miles traveled. Two surfers, Dave Rastovich and Craig Anderson, tracked waves generated from this single storm in an exhausting attempt to surf the same wave twice as they pulsed eastward through the Pacific. As these waves thundered across the legendary reef of Teahupoo, reeled down the endless point breaks of Mexico and onwards towards a frosty Arctic conclusion the pair gathered friends Kelly Slater, Chris Del Moro, Alex Grey, and Dan Malloy for this cinematic and cosmic experience of a lifetime. The SURFfit DVD is the total body premiere exercise system that utilizes fit: functional integrated training. Triggering multiple muscle groups in a various range of motions, these strengthening and stabilizing exercises provide faster and better results than the more traditional cardio and strength training programs of the past. Developed over 20 years of collaboration between expert trainer and professional athlete, the workout progression delivers remarkable results balancing the body along all three planes of motion: sagittal, coronal, and transverse. With SURFfit you will enjoy increased strength, power, agility, endurance, flexibility and balance. But SURFfit isn't just for surfers and pro athletes. Anyone who wants to be in the best shape of their life can use these training techniques to help them achieve the best fitness and health of their life! Lost surfing DVD featuring stylemaster ripper Chris "Wardo" Ward. The complete series plus over a hour of never before seen bonus surfing and stories. Running time - 4:20. From grom phenom to video sensation to the leading free surfer of his generation, to a stint as a World Tour competitor... tall tales of radical, rowdy and ridiculous exploits have followed Chris Ward. Featuring footage gathered over an entire career, with candid interviews and testimonials of tumultuous turmoil. Through the eyes of the dozens of people who "know" him best, we attempt to unravel the myth, the mystery, the misery, the highs and lows wherever Chris goes... co-starring Mason Ho, Cory Lopez and many more. The "Live From the Moon" surf DVD is a journey into modern surfing & surfing travel searching for the most remote exotic breaks and desinations. A first hand look at the awesome and unforgiving power of the sea. From intense slabs in Ireland, to the deepest perfect tubes of Indonesia. Body Glove explored, hunted, and conquered! Live From the Moon will take you off the grid for a surfing DVD adventure of a lifetime. 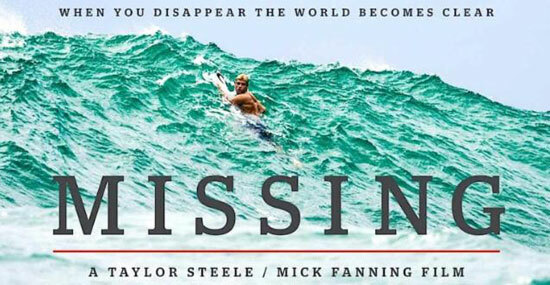 Legendary surfing DVD producer Taylor Steeles brand new film MISSING puts Mick Fanning in some of the most incredible places on the earth along with his good friends John John Florence, Jordy Smith, Matty Wilko and the master Tom Curren. Under the direction of the world renowned surfing film producer, this project grabs Mick Fanning out of the competition arena of the ASP and gives him a airline boarding pass with a blank destination and for 3 weeks he is re-located all over the planet with only a passport and surfboard at his side. As a result, the surfing is off the charts, raw and some of the best that you will see this year. From Africa, Ireland to Central America & Spain, the experience actually is life altering for Mick Fanning. Woodshed Films & Dan Malloy and friends set out to surf and bike their native California coast last Fall. After two months & more than 700 miles, they were rolling back home to Ventura CA. Dan Malloy wrote - "I learned more about the people and place here, than I had in thirty five years and a thousand trips by car." Book: 112 pages, principle photography by Kanoa Zimmerman. Producer: Woodshed Films / Dan Malloy, Kanoa Zimmerman and Kellen Keene. Master surf DVD film maker Jack McCoy ventures into a new realm with his latest breakout feature, A DEEPER SHADE OF BLUE. This is not a surf movie, it is a film about surfings deepest roots: in the subconscious; in ancient lore; in the craft of surfboard building; in mans perpetual quest for a joyful relationship with the natural world. In eleven interwoven chapters, todays leading surfers are linked to those who came before, for a deeper appreciation of what it means to be a surfer and the soulful underlying power of modern surf culture. Filmmaker Aaron Lieber takes us around the world in this inspiring journey that charts the rise of one the most progressive women in surfing today. 2012 US Open winner Lakey Peterson provides an intimate window into her life, sharing the struggles and triumphs she has faced along the way. Breathtaking cinematography and a killer soundtrack make Zero to 100 unmissable. A true tale that will have you laughing, crying and doing push ups by the end. Jack Coleman's 3rd full-length surfing DVD film, Secret Sound Underground, is going to twist your mind into one of those 2 foot Disneyland kaleidoscopic mega-lollipops. In such a film fashion that only Jack knows, he captures the underbelly of the surfpunkfunk world and lays it down onto film that's older than you are. Have fun. Featuring Creed McTaggert, Andrew Doheny, Ozzie Wright, Ellis Ericson, Jason Salisbury, Alex Knost, Jared Mell, Mitch Coleborn, Beau Foster, Connor Coffin, Mob Rachado, Ford Archbold and Mason Ho. Innersection Black surfing DVD - Innersection is the worlds original open-source freesurfing competition, developed by Taylor Steele and Nathan Myers. The 13 all-new sections that form INNERSECTION: BLACK were each produced by the surfers themselves, then selected from hundreds of online submissions to be reimagined for this final release. The surfing was filmed all around the world, with highlights in Canada, Portugal, Costa Rica, Indonesia, Australia, and Hawaii. Theres also an all-new submission from defending $100,000 champion, Albee Layer. Innersection is pure surfing: surfer created, viewer selected, and ocean inspired. Producers: Taylor Steele, Nathan Myers, Justin Heit and Andy Slipka Directors: Nathan Myers, Calvin Knowlton, Saul Garcia, Ben Gulliver, Damien Robertson, Adam Chilton, Adam DeWolfe, Joao Rito, Nat Lanyon, Jay Button, Dan Norkunas, Zachary Hill and Toby Cregan Starring: Albee Layer, Peter Devries, Gilbert Brown, Carlos Munoz, Raph Bruhwiler, Leif Engstrom, Asher Pacey, Nic Von Rupp, Alex Chacon, Keikea Elias, Josh Mulcoy, Brett Burcher and Noah Cohen. and everything that happens in between. Directed by: Nathan Myers, Saul Garcia, Ben Gulliver, Nat Lanyon, Adam Chilton and Joao Rito Starring: Ozzy Wright, Peter Devries, Joel Fitzgerald, Harrison Roach, Vaughan Dead, Otiz Carey, Asher Pacey, Chris Del Moro, Daniel Jones, Torrey Meister, Reubyn Ash and Cowboy. RUSSIA DVD & limited edition Book by Surfing photographer Chris Burkard and writer Ben Weiland. These guys traveled with Keith Malloy, Dane Gudauskas, Trevor Gordon, and Cyrus Sutton to Russia's forbidden peninsula, Kamchatka. What follows is an amazing limited edition 100 page Book & DVD combination from their adventures. The Book is roughly 100 pages of photography and editorial. Table of Contents: Arrival, Air, Camp, Journey, Land, Surf, Fish, People. Surfcraft Media Productions proudly presents Steve Cleveland latest surfing DVD video movie A Paradigm Shift a Great new surfing DVD video from the maker of Fresh Fruit for Rotten Vegetables among other great titles! Featuring: Chris Del Moro, Alex Knost, Chad Marshal, Jai Lee, Kassia Meador, Jen Smith, Harley Ingleby, Colin Whitbread, Brian Anderson, Dane Peterson, CJ Nelson, JJ Wessels, Harrison Roach, Joel Tudor, Darshan Gooch, Jared Mell, Leah Dawson and Tyler Warren. This amazing surfing DVD video was shot in one day. More than 25 filmmakers and surfers worked in unison to document the world of surfing in a single 24-hour period: May 2, 2012. From world champs like Kelly Slater and Stephanie Gilmore to free spirits like Dave Rastovich, Ozzy Wright and Alex Knost, this project brings together shapers, photographers, legends, beginners, third world, first world and surf world. Some scored big. Others couldn't find a ripple. It's all part of the surfing experience. From contests to camping, hanging at home or hitting the road, veteran surf filmmaker Taylor Steele pulls together an epic, international cast to prove the best place to be is here and now. Featuring: Kelly Slater, Dave Rastovich, Ozzy Wright, Alex Knox, Rob Machado, Stephanie Gilmore, Conner Coffin, Matt Meola, Jay Davies, Albee Layer, Ford Archbold, Gabriel Villaran, Dede Suryana, Leif Engstrom, Peter Devries, Reubyn Ash, Grant Baker, Garut Widiarta, Mikala Jones, Steve Sherman, Brad Gerlach, Alex Gray, Ezekial Lau, Andrew Serrano, Junior Faria, Gilbert Brown, Lauren Lindsey Hill, Jack Robinson and more. Polyester Surfing DVD is when true visual expression meets the artistry of surfing. The film features the surfing life of California's Al Knost. Polyester is independent filmmaker Jack Coleman's first feature length surf film, running time is 35 minutes. The film is a completely independent production, with no branding. Shot, edited, and produced entirely by Jack Coleman. A surf film captured all 'in camera' with no digital imagery or after effects. Polyester took one-year to complete. Featured locations in project were Mainland Mexico, Central Baja, and a lot of the famous Southern California surf spots that Alex frequently visits. The supporting casts of surfers in Polyester include: Ford Archbold, Tanner Prairie, & Jared Mell. Both Jack Coleman and Al Knost are currently living in Costa Mesa, California. This new surfing DVD video features an insane soundtrack as well with tunes by White Fence, Ty Segall, The Growlers, Tomorrow's Tulips, old Vincent Gallo, and some other awesome tracks. We at Thalia Surf truly believe Jack Coleman is on to something here, Polyester is definitely ahead of the game in terms of film making, editing, and production. Pretty hard to believe this is Jack's first film. A surf DVD Excursion into the Absurd featuring: Dane Reynolds, John John Florence, Kolohe Andino, Yadin Nicol, Craig Anderson, Chippa Wilson, Dillon Perillo, Conner Coffin, Mitch Coleborn, Dion Agius, Evan Geiselman, Taj Burrow, Jack Freestone and Nate Tyler Filmed on location in Japan, Australia, New Zealand, Indonesia, Europe, and the Caribbean, Dear Suburbia, is the latest release from Kai Neville and is the follow up to his previous films Modern Collective and Lost Atlas. It is a high-performance, location-based surf film set against exotic landscapes, objects and personalities juxtaposed with the traditions of suburban life. Spontaneity versus routine. The unknown versus the familiar. An interpretation of our lifestyle, culture, riding waves, traveling the world  a pirouette into the absurdity of it all. The result is a graceful, often schizophrenic glimpse at modern life with a surfboard and a passport. Dear Suburbia surfing DVD was filmed on RED & 16mm. The all new Transworld Surf Surfing DVD movie featuring Matt Meola, Dillon Perillo, Dave Wassel, Creed McTaggart, Conner Coffin, Parker Coffin, Jay Davies, Dylan Graves, the Gudauskas Bros, Andrew Doheny, Mitch Coleborn, Brett Barley, Torrey Meister, Sterling Spencer, Brandon Gibbons, Oliver Kurtz, Hector Santamaria, Michael Dunphy, Pete Devries, and Dane Zaun. WAY OF THE OCEAN: Australia surfing DVD explores the connection between man and sea through a visual feast of poetic motion. This wave rich continent provides a breathtaking backdrop to some of the best surfing found on the planet. Since it was first introduced in the early 1900s, surfing in Australia has become a mainstream pursuit and for this country devoted to the ocean lifestyle, it is more than a way of life. From the tropical paradise of the Great Barrier Reef down through the frigid Southern Ocean and up to the arid desert of the West, the film captures an intimate portrait of this unique land. Vibrant super 16mm and High Definition cameras bring to life the stunning visuals, set to a heart thumping original score. Welcome to the odyssey of your life. Surf film featuring Dane Reynolds by Marine Layer Productions. Directed by Yani Ladori. Edited by Dustin Miller. 35 minutes. Bonus- Seen/Unseen in full resolution + Worried Shoes (non-edit). 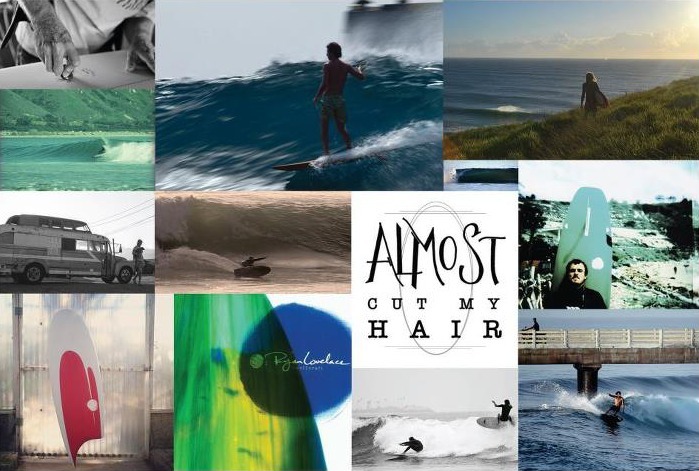 The Almost Cut My Hair surfing DVD showcases the surf-sliding talents of the 805's most groovy young lions of style, people like Trevor Gordon, Travers Adler, Troy Mothershead, and Simon Murdoch, alongside decidedly less local but equally groovy wave riders like Ryan Burch, Cyrus Sutton, and Ari Browne. And, while familiar haunts like Rincon and Sandspit get the bulk of the on-screen coverage, the footage, much of it shot by über-talented surf documenter Mike Kew, is of Lovelace-influenced surf action from spots all over the world, including India, Bali, Mexico, and Australia. A soundtrack comprising of musicians like Johnny McCann and Landon Smith, all of whom are personally connected to Lovelace (many of whom actually ride his boards), and you get a film that is essentially a homemade affair. In other words, Almost Cut My Hair is as much about "good, clean surfing" as it is about Ryan Lovelace's own handcrafted, Santa Barbara-centered universe and all the wonderfully skilled people who inhabit it. The sport of Stand Up Paddle seems to have popped up out of nowhere. The truth is, the sport has deep roots in both early Polynesian and Hawaiian History as it is truly a combination of outrigger paddling and surfing. The first regular Stand Up Paddle enthusiasts were playing around in Waikiki as early as 1939, when Duke Kahnomoku used to stand up on an australian surf ski. Later, in the 60's and 70's guys like John Ah Choy and John Zapotocki used to do the sport regularly up into the late 90's until they finally were getting to old to keep surfing. Around that Same time, Laird Hamilton and Dave Kalama played around with paddles on Maui and although at first no one seemed to take notice, it wasn't long before the sport was attracting all sorts of users from all over the world. Now, Stand Up Paddling is done almost everwhere there is water, and the sport has gone in multiple directions. Some people like the excercise and weight loss aspects in flat water, others like to race, and the most extreme are taking the boards out into the waves. Filmed in Hawaii, Fiji, and Tahiti, That First Glide is a must see movie for everyone and features most of the premier athletes that got the sport off the ground.